The first thing that pops up into my mind when trying to open my post for those berries is Miranda Priestly in Devils Wears Prada: "Florals? For spring? Ground breaking." Except that here you would replace florals by berries and Spring for Autumn. Yet there is a reason this colour is so popular comes this time of year. We like dark hues, but we still want a pop of colour. So berry tones are the perfect solution for this, a reminder of the fallen leaves, and a promise of mulled wine to come! And it seems lots of the lipsticks and glosses I picked up in the past week (I know, and this is not even everything, I went shopping cray cray) were in those berry tones, ranging from burgundy to rose. Hard Candy Ombre Lipstick in Friendly: This one is particularly fun, as it promises the 90's lipline effect in one product. The 90's are really on right now, but I'm not sure if this trend will pick up! It is nice and creamy though. 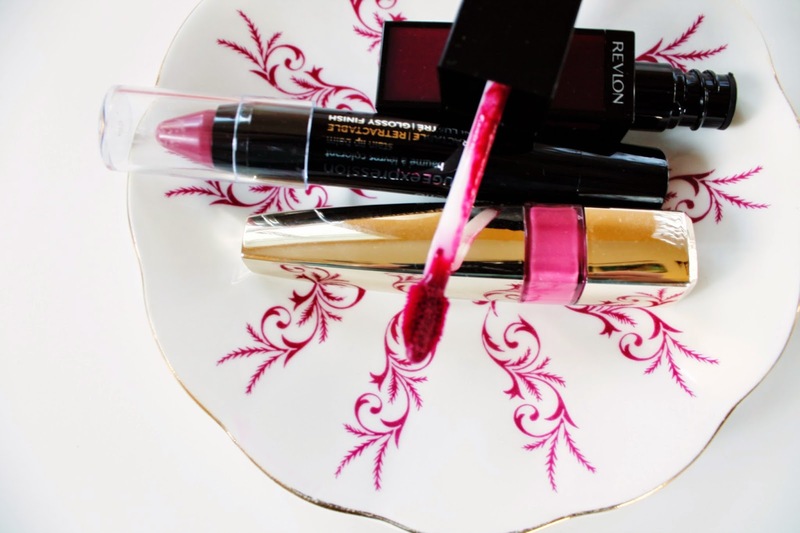 Revlon Colorstay Moisture Stain in Parisian Passion: I think this will be my favourite.a deep shade that will pop out from your scarf and knits!. Personelle Rouge Expression in Elegant: All the colours from the lineup were tempting I have to say! They're made with shea butter and are so moisturizing! L'Oréal Caresse Wet Shine in Romy: A blue toned pink gloss, I imagined it with rosy cheeks after an afternoon walk! Do you like berry toned lips in the Fall?